Single-emitter laser diodes are highly regarded for their long term reliability. However, these devices are very sensitive to backward propagating light within the delivery fiber. Backward power imaged onto the diode material, as small as 5% of the pump diode output, can cause accelerated diode degradation and, in the majority of cases, catastrophic failure. DPM Photonics offers filter technology that provides protection to pump diodes under these conditions (up to 30 dB). Splicing these filters to the pump output fiber rejects unwanted light before it reaches the diode. Protection filters are available for a wide range of standard light emitting diodes. 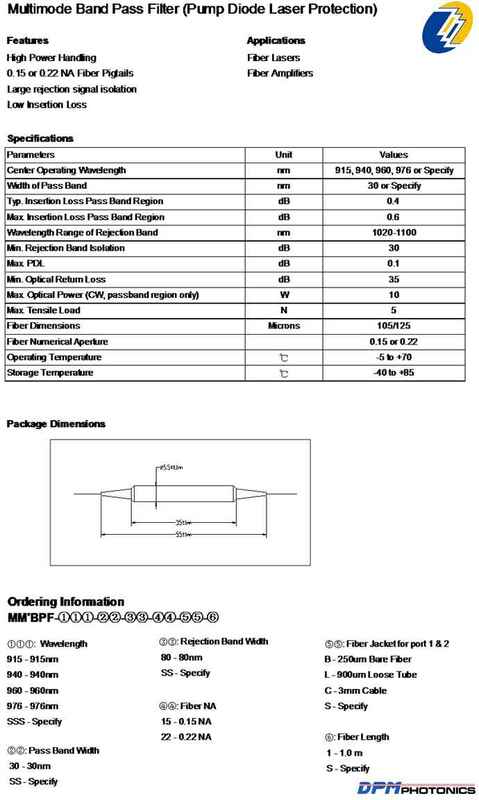 Fiber pigtails are 105/125 micron, with both 0.15 and 0.22 NA cores available. Operating wavelengths cover the majority of diode laser lines (915 nm, 940 nm, 960 nm and 976) and maximum power handling is 10W. If you do not see a Protection Filter from the standard configurations that meets your needs, we welcome the opportunity to review your desired specification and quote a filter best suited to your application. Different pump/rejection wavelengths or fiber pigtail can be accommodated.